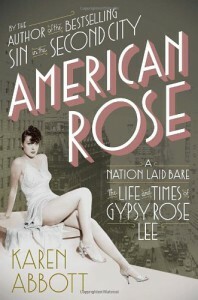 A fascinating and sometimes horrifying look at the life of famous burlesque performer Gypsy Rose Lee. Karen Abbott researched and met with Lee's sister and son to disentangle the truth from the legend Lee created about herself. One quibble: I hate when biographers write what a subject was thinking or feeling at a certain moment, without referencing where they got that information from. Abbott does this a lot, making parts of the book read more like a historical novel than a biography.